Adopting ITIL/ITSM and leveraging Opmantek solutions to increase Performance Management. Managing a network can be expensive, time-consuming, and at times confusing. Mixing different software and hardware products that are meant to assist in network management can sometimes add to the confusion. Managing different software versions, vendors, and products that only work with specific OS’s can become a job in itself. Following the best standards and practices combined with a good network monitoring and inventory software solution, can help you streamline the management process and increase performance management. No other IT standard is more valuable or praised than ITIL/ITSM (Information Technology Infrastructure Libraries, Information Technology Service Management). Adhering to this standard along with implementing Opmantek’s software solutions can reduce the number of tools your team uses, increase performance management while lowering noise and confusion. Learning and implementing the ITIL service lifecycle will significantly improve all aspects of IT management. However, ITIL is made up of an extensive series of processes. This blog will be focusing on the big four that have the most significant impact on performance management. The big four includes Incident, Availability, Capacity, and Service Level Management. Incident management is defined as a process for logging, recording, and resolving incidents. Not only can following ITIL help with incident management, but it also allows for operational maturity as a bonus. Operational maturity entails moving from a chaotic environment to one with value. Chaotic situations are typically ad hoc, have little to no documentation, and contain minimal IT operations. Opmantek solutions can assist you in every step towards a more mature organization. 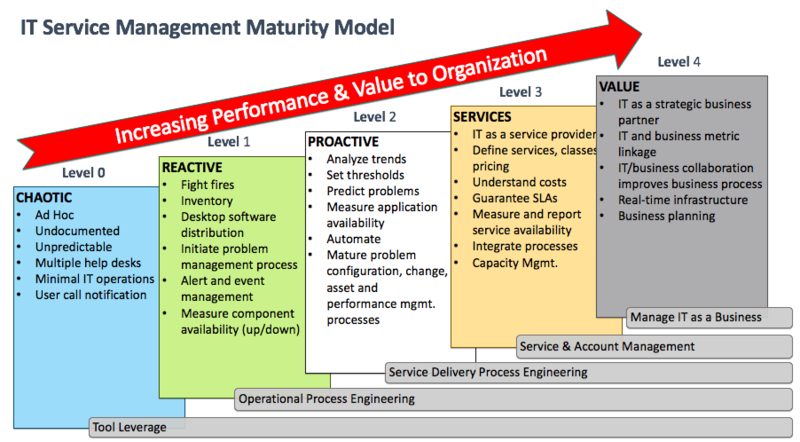 Moving from a chaotic level 0, as shown in the chart above, all the way to level 3 can be achieved merely by implementing NMIS, Open-AudIT, opEvents, and opReports. Getting to Level 4 is a matter of leveraging Opmantek solutions and planning within your organization to reach that goal. These modules assist in inventory, alert and event management, component availability and more. The goal is to have a plan of action to resolve unexpected events and get services up and running again as quickly as possible. These solutions can help you and your team analyze network trends and predict incidents before many ever have a chance of occurring. If interested in learning more about the IT Service Management Maturity Model take a look at our webinar on this topic here. Availability Management entails making sure that services are available for use during timeframes specified by SLAs. Another use of Availability Management is identifying and correcting issues before they have a chance to impact services. NMIS, Opmantek’s network management system, grants the ability to monitor services and create alerts when they are down or underperforming. These alerts can be seen visually through the GUI, sent as an email, or even sent as a text message. The alerts are automated and customizable and will only be sent to people you and your team deem relevant through an internal priority level system. Reliability is the key concept in Availability Management. Expanding NMIS to include opEvents will allow you to automate event handling and use proactive event management to lessen outages, improve performance, and provide a fast-track problem resolution solution while managing all your network events in one place. As organizations grow so does the usage of IT services. With this growth in usage comes a need to upgrade CPU’s, storage, memory, etc. Proper Capacity management ensures that the resources required are the right size to meet current and future business requirements. Opmantek’s opTrend, opCharts, and NMIS modules allow your team to manage network resources and visually analyze key performance metrics proactively. This enables you to predict resource exhaustion and plan more effectively by having the ability to create actionable activities when any current or future resource exhaustion is identified. Service Level Management’s goal is to have a negotiated SLA with customers, providing a framework by which services and service levels are defined and adhered to. Establishing the scope of services, hours of operations, and timelines to meet the SLAs are key factors in implementing a successful Service Level Management plan. Open-AudIT can assist your team with assessing the current state of your IT operations with detailed audits for Inventory Management, hardware/software changes, reporting, and more. This helps your team create more accurate infrastructure sizing and help mitigate the costs of excess or insufficient hardware capacity. Knowing exactly what is on your network makes it easier to meet SLAs and implementing Opmantek’s opSLA into your toolkit will grant you the ability to measure and monitor network and application response times with ease. Keeping track of what is on your network, adhering to agreed upon SLAs, ensuring proper resources are allocated, automating event management and escalation, and adopting ITIL/ITSM does not require multiple tools from multiple vendors. It can all be accomplished with a group of Opmantek’s core solutions, reducing the clutter and confusion of keeping track of numerous licenses and vendors. Even if you do need to keep track of multiple licenses, Opmantek does that too. Fully adopting the ITIL/ITSM and increasing performance management does not need to be a daunting task. Reach out to us and learn how your team can accomplish these goals and more. Schedule a demo of Opmantek solutions in action today or visit our learn portal for more information.